a work in progress | is there any more pie? Posted on April 28, 2014	by is there any more pie? Bakers beware. These are dairy-free, sugar-free, gluten-free muffins. Translation: not much flavor. But they’re healthy, and much better for you than packaged protein bars. 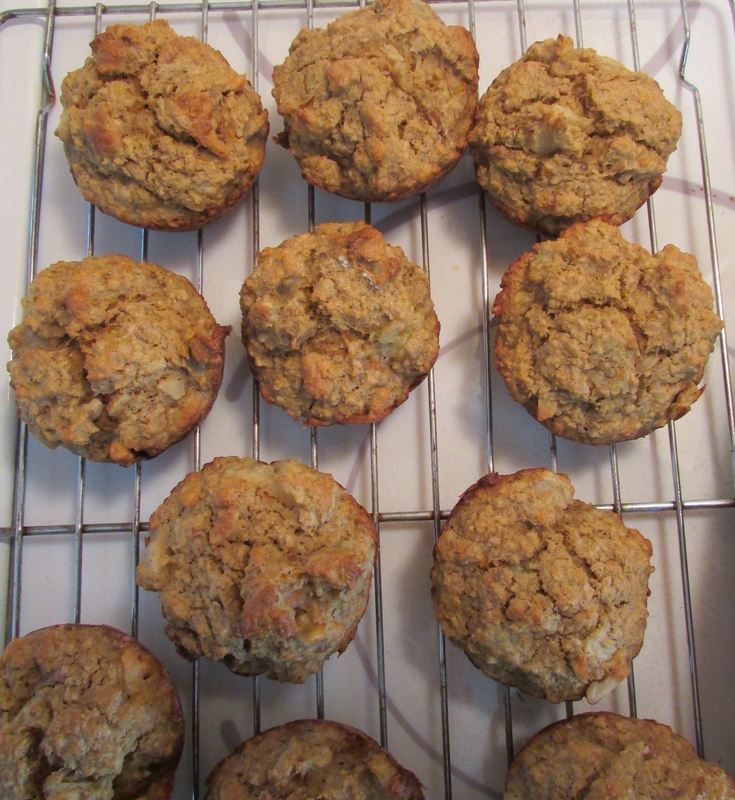 I tried this recipe, “Get Up and Go Muffins” from Spoonful of Sugar’s blog. I adapted them a little. Next time I’m going to add 1/2 cup blueberries! Preheat oven to 400 and grease muffin tin. Chop apples and put them in a saucepan with a splash of water and let simmer for 10 minutes until soft. Smash with a fork and then mix with the rest of the wet ingredients. Combine the wet and dry, then fold in raisins and walnuts and blueberries. Bake 15 min. until golden brown. These won’t rise very much.Let cool on racks for 10 minutes and then remove from pan and continue to let cool. Makes a dozen. I kept mine in a bag in the refrigerator and reheated one every morning for breakfast. They’re only 145 calories each, with 4 grams of fiber and 17 carbs. Protein is 4.6 and fat is 8. I made Dr. Andrew Weil’s Oat Bran muffin recipe with blueberries for a decade and brought them to work three days a week for breakfast. Last fall I ran the ingredients through Sparks people calorie counter and found they had 63 carbs. HUH! I was eating them to lose weight, not gain. Your 17 carb muffin sounds sooooo much better, though it looks like a lot of work.